This was a fun one to create. I used all Impress Inks to create these amazing blended background. After that, I splashed a few drops of water around and then stamped that big sentiment. I love that it is the main focus of the card. I added the "it's been a while" on a banner and popped that up on foam tape. The rainbow panel is all on foam tape, so it stand out a little from the white card base. For a little bit more detail, I added in some dew drops to finish off the card. I'm sending a huge thank you to Effie for having me and for the chance to use her stamps. I can't wait to make more cards very soon! I hope you have enjoyed my projects this month. Thanks so much for stopping by! Hope you have a great day! Terrific card Laurie! Fabulous background for the bold black sentiment! 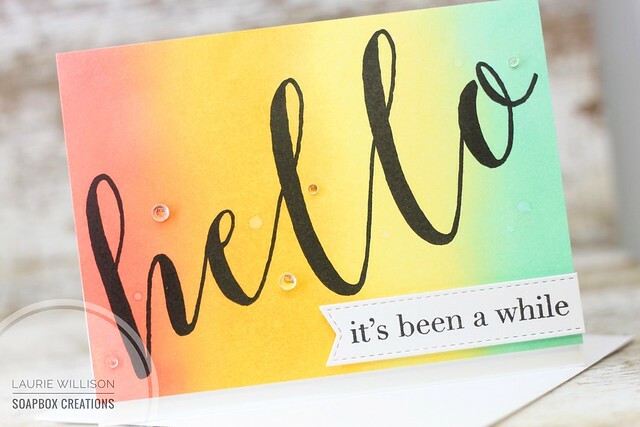 Beautiful blending on your background and I love how it makes your sentiment pop! Another gorgeous card! 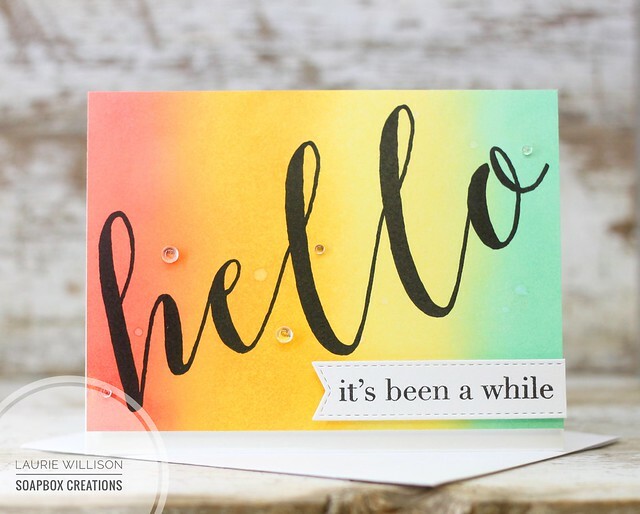 What a sweet card, Laurie, with your beautifully blended background! So, what do you think of Impress Inks? I don't own any yet so I'm curious.